The 'contacts' area of Membership is where you can add details for administrators within an association or club. Adding details of your key administrators will allow you to keep an up-to-date database of contacts, and also assist in important processes such as player registrations, player clearances, and in providing contact details to display in the SportsTG 'locator'. 1. Log into Membership at the association or club level. 2. The 'dashboard' will appear. Click on Contacts. Note: A green tick indicates that the Contacts section contains valid information. A grey cross indicates that there is not enough information to appear on a website's Locator module. 3. The 'Contacts' page will appear. On the left is a list of 'Board or Committee Roles' that you are able to populate. On the right is a table of 'Functional Responsibilities' where each board/ committee member's responsibilities can be selected. 4. To add details of a Board or Committee member, click on the 'down arrow' next to a Board/ Committee Role. The contact details fields for that role will appear. 5. Enter the member's contact details in the fields provided. 6. Three check boxes are provided: 'Receive Club Offers', 'Receive Product Updates' and 'Publish on Locator'. Club offers and product updates emails are sent monthly from SportsTG (further details are provided below under 'Receive Club Offers/ Product Updates'). Tick these options if you want the member to receive these emails (recommended). 'Publish on Locator' determines whether the contact person's name and contact details are shown on the club/ association 'locator'. 7. Under 'Functional Responsibilities' tick the boxes corresponding to the responsibilities the member has. A member can have multiple responsibilities, and more than one member can share the same responsibilities. Assigning the correct functional responsibilities is important because certain communications are sent from the SportsTG system based on their roles. This currently applies to Clearances & Permits, Finance & Payments and Registrations. For example, if a member is assigned to 'Clearances and Permits' they will be copied in on all emails automatically sent by the system relating to clearances/ permits activity. 8. One member can be assigned the primary contact by clicking on the 'Primary Contact' radio button. An association/ club's primary contact will appear in the top position on the Locator search results. Additionally, if SportsTG needs to contact someone from the club or association, this will generally be the person we contact. 9. Repeat steps 4 - 7 to add other board/ committee members. 10. Below the 'Board or Committee Roles' is a section for adding 'Other Roles and Contacts'. Add contacts to this section if it is not suitable to add them to the board/ committee roles provided. The only difference to adding a contact here is that a drop-down list is provided for selecting the role held by the member (if you want another role added to this list, contact your governing body). Note: If 'Committee Member' is selected for a member within the 'Other Roles and Contacts', they will be added to the above list of 'Board or Committee Roles' once saved. 11.When you have finished adding contacts, click on Save. 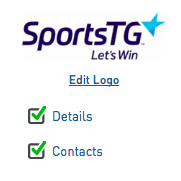 You have the option of determining which club/ association contacts should receive monthly 'Club Offers' and 'Product Updates' emails from SportsTG. We strongly advise that at least one contact is selected to receive this information. Details of these emails is provided below. Receive information about opportunities to participate in competitions and win fantastic prizes for your club or association, including cash prizes, sporting gear and equipment, and celebrity training sessions. The 'club offers' email is generally sent once every month. Receive useful information, tips and hints on how to best use SportsTG Membership. Stay up-to-date with all the latest developments across all products within the SportsTG system (Websites, Membership, Competitions, Registrations, LiveScore, etc). Stay informed of all the changes and updates that may affect your association or club. 'Product update' emails are generally sent once per month. More than one email may be received on the occasion that SportsTG needs to send important information about a critical product update. Receive information relevant to your sport as determined by your governing body.